So my new range is in the house but probably won't be functional until sometime tomorrow. I may not get any more baking done tomorrow, either, but I'm trying to relax about it. I have some recipes I was able to fix before this fiasco that I can share with you in the meantime. 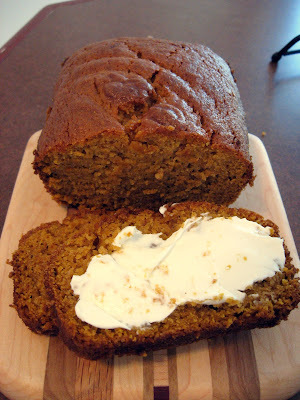 Pumpkin bread is one of my favorite quick breads. I like to eat it plain or with melted butter, but I love to eat it with cream cheese, as pictured above. I've adapted this recipe from Marjorie Standish's "Cooking Down East." Beat eggs. Add oil, water and pumpkin and mix well. Sift flour together with sugar, soda, salt and spices. Add to pumpkin mixture and mix well. 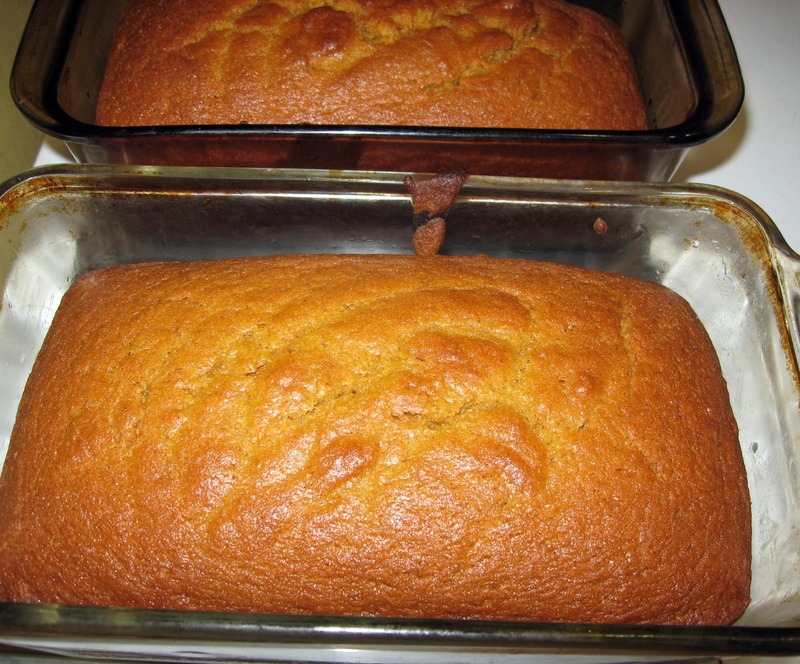 Turn into 3 well-greased loaf pans or 2 large, 2 mini, etc. Bake at 350 degrees for 1 hour. If you are doing mini loaves, check about 40 minutes into baking. 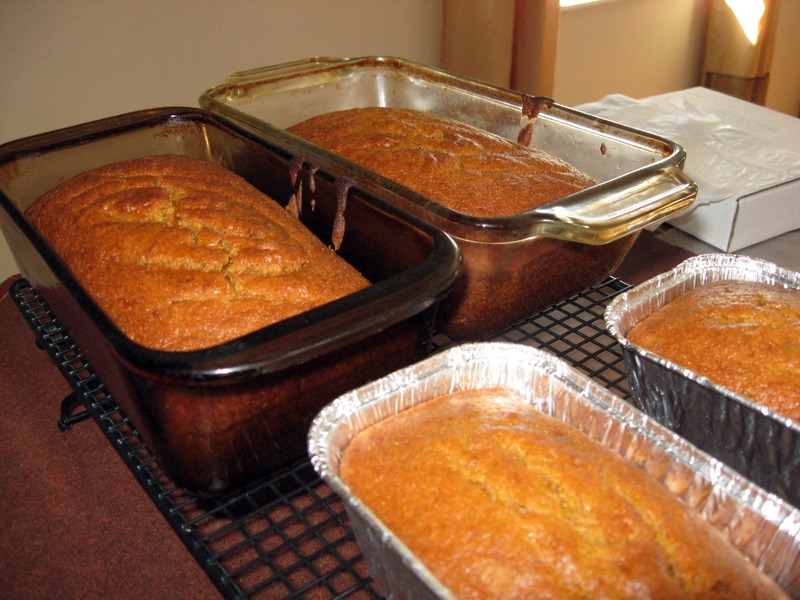 Loaves are done when knife inserted in center comes out clean (some moist crumbs may be on it, but it shouldn't be wet batter). Cool on wire racks. When completely cool, wrap in wax paper. These loaves freeze well. If you freeze, wrap in wax paper and then store in freezer ziplocs or other airtight storage. YUMMY. Look at those gorgeous things! 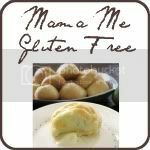 I am so impressed and intrigued with the mixtures of flours and how you get things to work out so perfectly without my dearest friend, Mr. Gluten. Oh Ginny it's not easy at first -- and I still wouldn't call it "easy!" Baking has got to be the biggest challenge. But you eventually get a feel for the types of flours that work best for different types of recipes and then you play around with it. Forever. Until you get it right. Sometimes I have to try a recipe almost 10 different times before I get it the way I like it with a texture I like! QUESTION. Can you do all brown rice flour and then the 1/3 cup sweet rice flour? And when it comes to the sugar can you do half brown sugar and half cane or stevia? I'm looking for lower fat and sugar alternatives but this seems to be the easiest to follow recipe I have found! I'm sure it would work well with the rice flour that way, and yes I think half brown would work fine on the bread, it just might need to bake a little longer or add an extra chew to it. I'm not sure about the stevia, but if you try it and it works out, will you let me know? 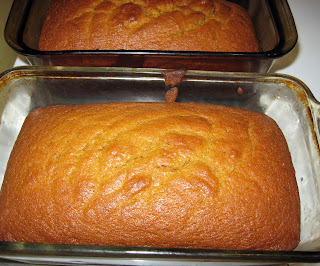 I love the taste of almond flour...how much do you think I could substitute for rice flour without affecting the loaf? I'm sorry I'm just responding to this! I'd start with about 1/3 of the flour, and reduce the fat content a bit, since almonds are high in oil and some of it is released in the heating. I used oat flour rice flour and 1/3 c of potato flour also cut sugar down to 2 cups and put 1/2 c of maple syrup in with the pumpkin! They also turned out delicious !